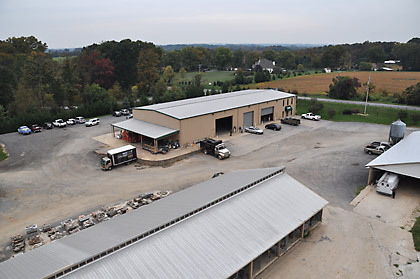 Rhine Landscaping, located in western Howard County, is situated on the Rhine family farm. The farm has been owned by the Rhine family since 1923. Jay Rhine is the current owner of the farm as well as the founder and president of Rhine Landscaping. Jay took over farm operations at the age of 19, when his father, Jack, died of lung cancer. In 1996, Jay started cutting grass and landscaping on the side to earn income to help subsidize the increasing costs of running a farm. Over the years, the landscape company grew as dairy operations on the farm diminished. By 2003, Rhine landscaping had grown to a company of more than 50 employees, while the farm had diminished to 350 working acres, 1/5 of what it had been just 7 years earlier. Today, Jay still owns and operates the farm, although on a much smaller scale. 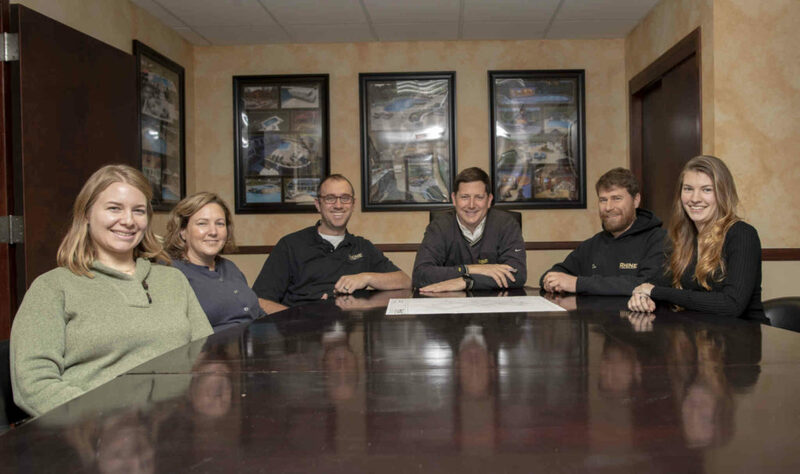 In 2000, Rhine Landscaping acquired its first designer, later adding a landscape architect and additional designers to the staff. 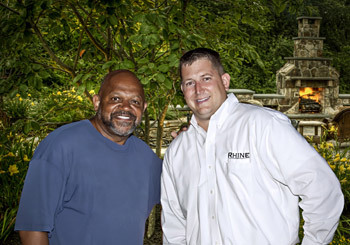 Rhine Landscaping operates primarily in Howard, Carroll, Baltimore, Montgomery, and Frederick Counties. However they have traveled as far as Ocean city, Washington County, and Kent Island to design and install custom landscaping elements. Rhine has earned one of the most respected names in the landscaping industry and continues to strive to provide excellent products and service. 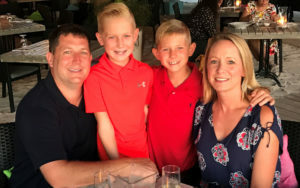 2015 marked Jay being in business for himself for 20 years, that’s a mix of his agriculture days and his passion for landscaping and construction. Jay has been married to his beautiful wife Salena since 2007 and they have a 8-year-old son Jack and a 6-year-old son Preston. Jay is on the Howard County Fair Board of Directors for the last 6 years and is currently the Vice President. He has also been serving as the Vice President of the Howard County Farm Bureau Board of Directors for the past 8 years and just came off that board in the fall of 2016. Jay was also on the Maryland State Farm Bureau board of directors for 2 years and that term ended recently. 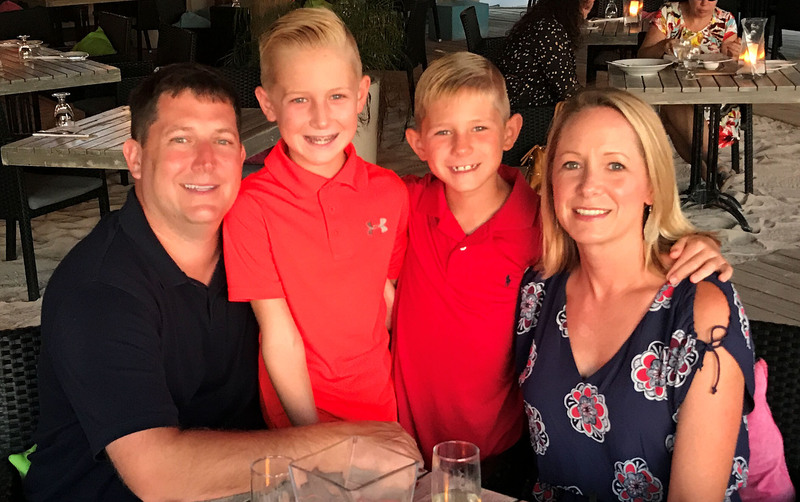 “It is very important to me that I help guide and give back to the community that has given so much to myself and my family.” -Jay Rhine. 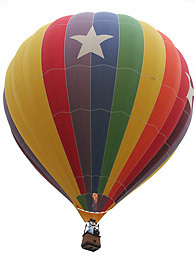 On October 11, 2011, Jay Rhine along with brother Matt, and sister Megan took their mother, Susan, on a hot air balloon ride for her birthday. Friendship hot air balloon company did the flying (“It was fantastic!” – Jay) and took off from the Rhine family farm. In the process we were able to take a few pictures of the farm and our facilities to share with you. 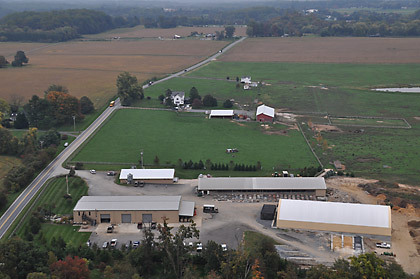 In this picture, you can see some of the 141-acre farm; Jay’s white farm house and out buildings for the cattle and horses is in the center of the photo. 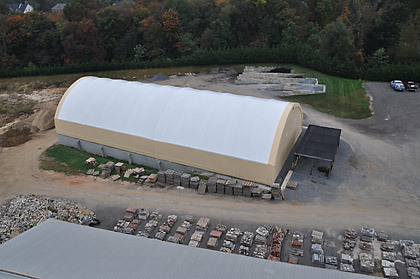 In the foreground, you can see the Rhine Landscaping facility; to the left is the main shop/offices; the round top building is for topsoil manufacturing in the spring and round bale hay storage in the winter. The long building and the smaller barn were used until 2003 for milking Holstein cattle and are now used for general storage. On the farm we currently house horses, longhorn Watusi cattle, and one bison named Cindy. All of the animals ran to the back of the farm when the balloon went up. This building was constructed approximately 10 years ago to be home to Rhine Landscaping. The building to the right in the foreground was for the Holstein milking operation (built in 1974 by John Lee Rhine, Jr.). The Rhines milked cows on this farm from 1923-2003 (80 years). Jessie Rhine, John Lee Rhine, John Lee Rhine, Jr. (Jack) and John Lee Rhine, III (Jay). Jay Rhine milked for 9 years while starting and building up the landscape company. Jay milked approximately 140 Holsteins twice a day at 1am and 1pm. His great-grandfather started with 9 cows. This cover-all cloth building was erected in 2008. In the spring we create screened topsoil and store it inside to keep it dry and weed free. In the winter it doubles as a round bale storage building to keep the rain and snow off the food for all of the cattle and horses. You can also see our paver and stone storage area as well as the plant holding area (black cloth suspended by telephone poles). It has an automatic water system that shades and regulates the water to plants until we install them at your home. In the summer of 2015 Ted Monachino was the Linebackers Coach for the Baltimore Ravens and a Rhine client. He and his wife Amy have been Rhine clients for 4 years. Rhine constructed all of their outdoor areas and having just completed a new swimming pool with Rhine and they agreed to shoot two T.V. commercials and a short infomercial for Rhine Pools. Just after the 2015 football season ended Ted took the Defensive Coordinators job with the Indianapolis Colts. 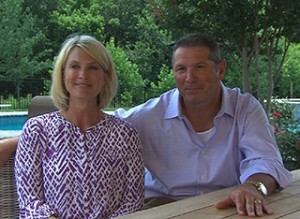 “Ted & Amy were amazing, they refused to let me give them one dime for being on camera for Rhine. They have become personal friends of mine over the last 4 years; they are really the most genuine humans on the planet and just all round good folks. I really wish Ted the best in the future with his coaching career, if anyone deserves good things to happen for them it’s him and his family” -Jay Rhine. today’s business world. To have the opportunity to make it happen and not make that into reality just seems lazy to me”. –Jay Rhine. 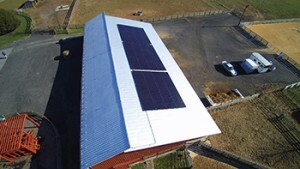 98KW solar system was installed on our farm. We installed Suniva panels, they are US based company. We installed a total of 300 panels between the two buildings. 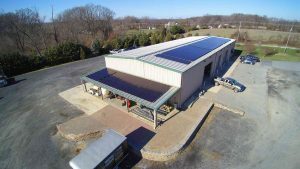 We contracted with Solar Energy World out of Elkridge in Howard County and were very please with the process from start to finish and would highly recommend them. “It was important to me that we used a local business to do our install and that we chose a panel from a U.S. based business.” –Jay Rhine. On June 30, 2015 Jay Rhine (center in white) asked his team for his Birthday to gather and pose for a group photo to mark his 20th year in business.